Zurich ETH developed the prototype of the first inventer. Extremely a lot of expenditure for 576 watts of top achievement. Here the dashboard. Even a far north situated industrial nation like Germany could produce a big part of the needed energy by the roofs of the houses. Photovoltaic has much potential. Inverters for the grid connection of photovoltaic systems. Directory over all our reports about inverters. Fair report from Intersolar 2005 in Freiburg. In 3 parts. fair in general, only about Photovoltaikand special part solar power for Africa. A biaxial tracked photovoltaic is the landmark of the Intersolar, which greets the visitors at the entrance. Indeed, not correctly turned towards the sun. The intersolar fair 2005 was too big for existing 3 fair halls with 12,000 ms ². Not to have to put up tents again it is extended till 2006 by a hall 4 with 4800 ms ². Above the exhibition center circles a Blimp. Blimp are holding the form by the inside pressure. At a zeppelin, however, by a stiff scaffolding. If one has seen the adaptable photovoltaic foil of Sharp just on a photovoltaic fair and sees all at once a Blimp, one catches of course immediately to calculate. WLAN rip of, no thanks! 11.60 EUR for 2 hours. What should somebody do with such an offer on a fair? An offer with time limit to be consumed in one block is senseless. 12,5 ms ² and 1,550 watts with one modul makes the world-biggest photovoltaic possible. The modul is from Ertl lower Austria. Station with photovoltaic and LED lamps. Slightly clear photovoltaic on the top, below a surface with LED lamps. Light of the day provides for more lighting and security at night and everything without mains connection. During the day the light comes by the 10% transparent photovoltaic. The energy is stored and provides also at night for lighting. Who holds jet of water on something what leads up to 1,000 volts of tension? This photovoltaic switches off at 100 degrees and does not endanger the fire brigade. 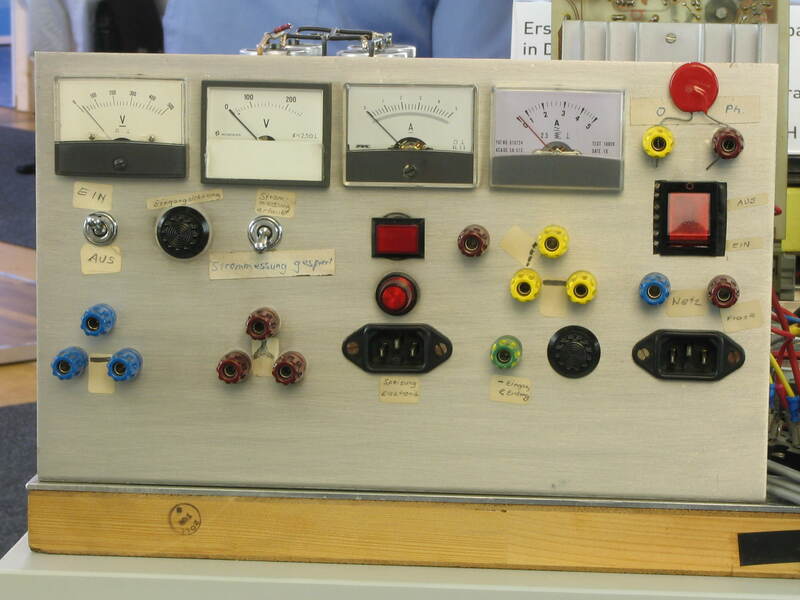 A real museum piece from the year 1984 was to be seen in the exhibition stand of Baden Wurttemberg: the first inverter with one has tested net feed functions. A victory for a complete diffferent inverter stategy on the roof of the German Bundestag in Berlin. Modular instead of high voltage. Normally a net-coupled photovoltaic equipment switches off immediately if the net has no tension. Protection for electrical engineers maybe just repairing the grid. How does a ventilation system with heat recovery function? In the exhibition stand of Aerex had been a very clear explanation for this. If it is very warm in summer, the heat recovery is undesirable. This living space airing has already integrated the bypass for the summer activity. On the top left in the picture is the flap of the summer bypass. Thus the chill current of air from an underground buried pipe is not warmed up by the exhaust air.